(Nanowerk Spotlight) Metal nanomaterials are often synthesized using the toxic reagent formaldehyde at concentrations thousands of times higher than necessary. Many of these same nanomaterials are being investigated for use in cancer treatment – however, there is a risk that they could do more harm than good. The large excess of formaldehyde that is used originates from methods developed 100 years ago. Because these methods work well, they have stood the test of time. By better understanding the role that formaldehyde plays in nanomaterial synthesis it will become possible to reduce or eliminate this toxic reagent. By eliminating formaldehyde it will become safer to prepare these nanomaterials and safer to use them in cancer treatment. "We discovered that most of the formaldehyde used in preparing silver nanomaterials is consumed by formation of a polymer" Reed explains. "Formaldehyde reacts with ammonium hydroxide to form a previously unnoticed polymer. When we decreased the ammonium hydroxide concentration it became possible to decrease the formaldehyde concentration, too." At the same time, these materials maintain optical activity in the near-infrared, the property that makes them attractive for treating cancer with light. The excessive use of toxic formaldehyde in fabrication processes for nanomaterials is particularly worrisome in the area of nanomedicine where these materials are deliberately injected into the body for diagnostic or therapeutic purposes. Many of the synthetic routes to nanoshells and core-shell metal nanoparticles use a large excess of the toxic reagent formaldehyde as a reducing agent. Reed notes that one of the early methods reported for coating silver on silica spheres made use of 1 mmol of formaldehyde for reduction of a 0.15 mM solution of silver ("Silver Nanoshells: Variations in Morphologies and Optical Properties"). He estimates that a 3000-fold more formaldehyde is used to prepare silver nanoshells than necessary. "This large excess is based on Zsigmondy's original silver nanoparticle synthesis reported in 1927 and is typical of coating procedures" he continues. 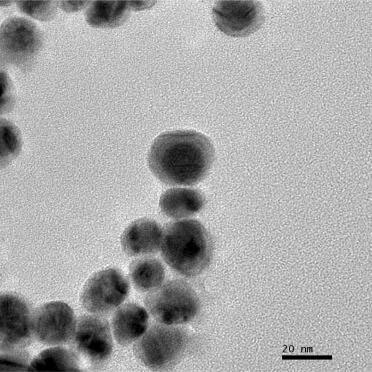 "Other reports have used a 1000-fold excess for coating silver on polystyrene beads or gold nanoparticles, up to 320-fold excess for coating silver on silica nanowires, a 346-fold excess to coat silver onto latex spheres, and a 24000-fold excess for layering silver onto tin-coated silica nanoparticles." Demonstrating an approach to developing greener synthesis methods, Reed and his team fabricated silver-coated gold nanoparticles suitable for phototherapy. Although formaldehyde still is an essential component of this process, they were able to reduce its amount 100-fold compared to previous processes. Part of this minimization resulted from the discovery that ascorbic acid (vitamin C) can be used as a reducing agent in combination with formaldehyde. "Understanding this previously overlooked polymer formation is a good starting point for minimizing formaldehyde use in the synthesis of nanoshells and other core-shell nanomaterials" says Reed. "We expect that this will result in greener syntheses and more biocompatible nanomaterials suitable for medical applications." In previous Nanowerk Spotlights we have raised the issue that today's nanomanufacturing processes actually are quite dirty and polluting activities ("Not so 'green' nanotechnology manufacturing"). As Reed and his collaborators show, by designing greener synthetic routes it will become possible to more safely prepare metal nanoparticles without creating hazardous waste. An issue that is particularly important for applications in nonomedicine. As this particular example shows, this new understanding of formaldehyde will allow for changes in how many types of nanomaterials are synthesized. Nanoparticles prepared using green methods are more likely make it through the regulatory hurdles associated with medical applications.